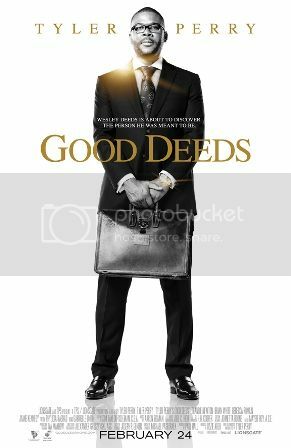 Tyler Perry's latest film GOOD DEEDS has announced Good Deeds:Great Needs, an initiative to support Covenant House, a non-profit organization that provides support for homeless youth. Through GiftCardGiver.com, Good Deeds:Great Needs will be collecting unused gift cards and donating all collected to the organization. In addition, Lionsgate will make a financial donation to Covenant House every time the GOOD DEEDS trailer is shared. The goal for this initiative is to galvanize communities to share the news and submit gift cards, to provide hearty meals, warm beds and shelter for the homeless youth served by Covenant House. GOOD DEEDS also presents fans the opportunity to win a Valentine’s Date Night! Just head over to the GOOD DEEDS Facebook page and submit your “love story” for the chance to win a $500 Visa Gift Card! The contest can be found here. TYLER PERRY’S GOOD DEEDS opens in theaters everywhere on February 24, 2012. The film is a moving, uplifting drama about coincidence, courage, and the defining choices we make on our paths to happiness. To learn more and share Good Deeds:Great Needs, visit www.gooddeedsgreatneeds.com.